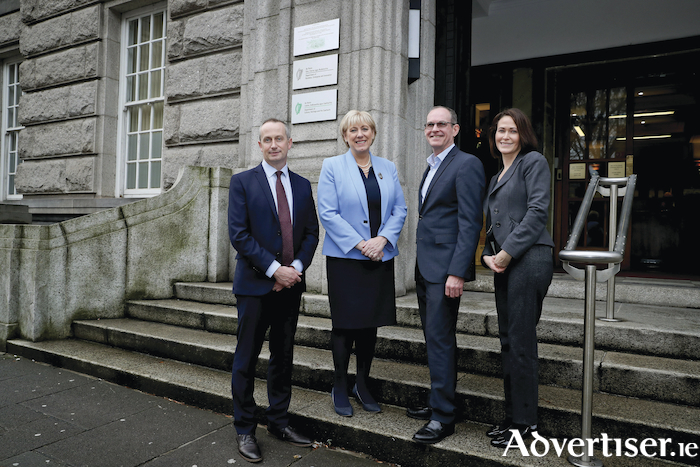 Minister for Business, Enterprise and Innovation, Heather Humphreys TD with from left Leo Clancy, IDA Ireland and Richard Haxby, MathWorks Ireland and Catherina Blewitt, IDA Ireland. MathWorks announced plans this week to grow its Irish business, with 85 jobs coming on stream in its Galway office by the end of next year. The company, a leading developer of mathematical computing software, announced the new positions this week as part of a plan to develop its Irish business. Twenty job openings are currently available with a further 65 jobs expected to be created next year. The Galway office provides centralised sales and services support to the company’s operations throughout EMEA and is building the team with candidates offering IT experience and fluency in multiple European languages. MathWorks set up its Galway office two years ago. Today, the company’s Galway team offer support in 11 languages, range in work experience from seasoned professionals to new graduates, and represent diverse geographical backgrounds, including long-term Galway residents, those who have relocated from cities such as Dublin and Cork, and those originally from countries such as Germany and Finland. Martin Shanahan, CEO of IDA Ireland, also welcomed the investment. “We are confident Ireland can meet MathWorks Galway’s expansion needs given our proximity to the European market, the steady pipeline of talent spanning professionals and students, and our investments in economy and infrastructure,” he said. MathWorks opened the Galway office with an initial focus on sales and support in the EMEA region. Today, MathWorks Ireland spans customer-facing roles including sales and services support, inside sales, channel development and support, marketing, and finance and administration. Most recently, the office expanded to include a team of customer success specialists who focus entirely on helping customers realise the return on their investment in the company’s flagship products MATLAB and Simulink. For more information on MathWorks Galway and the available job openings, see mathworks.com/company/jobs/galwayarea html. Page generated in 0.2093 seconds.